With a little sheet pan savvy, flavor-packed chicken tikka masala has never been more accessible. While we suggest marinating the chicken for at least four hours, if you didn’t plan ahead, you can simply marinate the inherently tender chicken thighs for as long as you have time for. This sheet pan dinner couldn’t be easier (or more delicious), and utilizing inexpensive London broil, it’s one you’ll come back to again and again. Serving this budget-friendly dinner with a shortcut aioli takes the entire meal up a notch with minimal effort. In testing, we even found that using jarred roasted garlic, rather than preparing your own, absolutely delivers on flavor. London broil will be labeled as such in many supermarkets, but you can also substitute flank steak or top round. Shrimp Scampi, a no-fail family favorite, has legitimately never been easier—oh, and we upgraded it with veggies, too. All the flavorful magic of this recipe happens on the sheet pan: Roasting shrimp, cooking broccoli and tomatoes, and creating a vibrantly mouthwatering lemon-butter sauce. We have a saying around here: A good sheet pan dinner is always a winner. And this quick and easy steak and veggie supper is a shining example. It’s a delicious taste of what cookbook author Julie Grimes offers in $10 Dinners: Delicious Meals for a Family of 4 that Don't Break the Bank; grab a copy today for more family-friendly recipes that are equally friendly on your wallet. Make perfectly pressed and toasty Cuban sandwiches for a crowd in one go with this genius sheet pan technique. Beyond being an obvious choice for your next party or tailgate, this recipe is an incredible way to recycle leftover pork roast or pork tenderloin into a delicious way to feed a group. Brushing the bread with pickle juice is a smart trick for keeping the bread from drying out too much and delivers an additional punch of flavor. Serving brunch to large group has never looked so easy or delicious as with our XL Dutch baby (I guess you could call it a Dutch adult). You can have this large, savory pancake—boasting gloriously crisp, golden brown edges, fluffy pockets dispersed through the center, and plenty of bacon goodness—for 8 on the table in under 40 minutes. This fantastic sheet pan chicken supper is simple to throw together and packed with robust fall flavor. While it’s a great dish to add into your weeknight dinner rotation, this roasted chicken dinner is impressive enough for casual entertaining. Feel free to swap out the butternut squash for sweet potatoes if you’d prefer. And to find even more inspired sheet pan meals, you’ll definitely want to pick up a copy of One Sheet Eats: 100+ Delicious Recipes All Made on a Baking Sheet. One of your favorite sandwich classics, transformed into a quick, easy, and totally vibrant sheet pan dinner. This genius recipe is the perfect solution for anyone who craves delightful, soft and fluffy steamed buns, but doesn’t own a steamer (i.e. most of us). While cooking a whole fish definitely seems intimidating, this is the recipe to show you just how easy it really is. But don’t worry, no one has to know—because it’s gonna look ridiculously impressive when served, no matter what. Our sheet pan take on “egg-in-a-hole” is such a perfect play for a fun, and totally photogenic, weekend brunch. This technique cooks salmon perfectly every time. The sauce is flavorful and rich, but not heavy--just right for a weeknight. Get dinner on the table quickly tonight by simply roasting shrimp and broccoli together for a quick, flavorful meal. Here's the delicious proof that you can serve a complete, no-mess fish dinner in less than 25 minutes. This is the kind of sheet pan dinner you'll want to make all fall and winter long. Removing a chicken's backbone—a technique called spatchcocking (or butterflying)—ensures juicy meat and golden crisp skin in less time than roasting a whole bird. Although it does require some simple knife skills, it's the best and fastest way to roast a chicken. A complete sheet pan dinner that feeds 4 people in just 40 minutes? It doesn't get much easier. You'll only need a few pantry-staple ingredients in addition to the fish, veggies, and potatoes. The Tzaziki sauce is optional, but we highly suggest serving it with the final dish for over-the-top flavor (Plus--you'll have time to prepare it while the potatoes are cooking). The seasoning blend called Chinese five-spice adds a warm note without pushing the apples into pie territory, and the apples are tart enough to balance the flavor too. Cooked fennel bulbs add a warm, aromatic note that makes this sheet pan dinner smell like a cozy, Autumn night. Roasting ingredients together on a sheet pan saves time and reduces cleanup. For the zestiest flavor, rub the chops with the brown sugar mixture the night before, and let them chill overnight. We love the double-cheese contrast here: Shredded cheese melts into a bubbly blanket over the tortillas, while crumbly queso fresco covers the veggies with a salty kick. It's an impressive dish for coffee table dining--it's fun to keep it all on the baking pan and serve as a shared platter. A metal cooling rack set in a rimmed baking sheet makes bi-level cooking possible--squash below, chicken above--so the meat's glaze stays nicely charred, while the juices drip into and moisten the squash. Enjoy this dish hot from the oven, with crusty bread to soak up the runny yolks. For firmer yolks and whites, leave the eggs on the rimmed baking sheet for 4 to 5 minutes before serving. This pizza is flat out delicious! Hold the tomato sauce with this easy, one (sheet) pan pizza. Test Kitchen Tip: Preheating the sheet pan is key to achieving a crisp, crunchy, pizzeria-worthy crust at home. 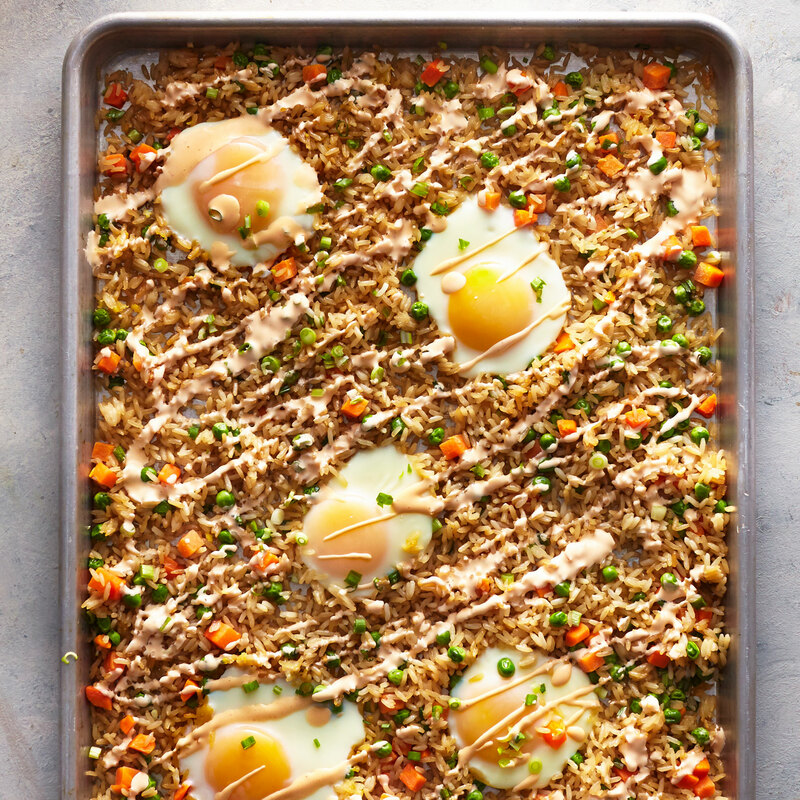 Top fried rice with rich, runny egg yolk and creamy Sriracha mayo for added texture and flavor. You don't need a wok for perfectly cooked fried rice, simply preheat a sheet pan, add oil, and use day-old or microwavable rice. Make sure the rice kernels are separate so that they are evenly toasted and won't glob together. Serve this dish along with mongolian beef, orange chicken, crab rangoons, or spring rolls. This simple sheet pan technique allows you to make five grilled cheese sandwiches with at the same time (meaning everyone around the table gets an equally gooey and warm sandwich at the same time), and with not much more effort than it takes to prep one. We went with 4 type of cheese—goat, white cheddar, provolone, and Swiss—for these buttery, rich sheet pan grilled cheese sandwiches, but feel free to change the cheeses up depending on what you like or what you have in your fridge. You could also dress these up with a few added toppings, like spinach, basil leaves, and tomato slices—or allow folks to customize their own sandwich. Your grilled cheese, your choice. It was determined in our test kitchen that it is legitimately impossible to be anything other than happy while eating these cheeseburger nachos—do with that information what you will. The cookout-inspired food mashup is as perfect served as a fun, grilled snack for guests (especially during tailgating season) as it is an easy, throw-together meal to use up leftovers from a weekend get-together. So while the cheeseburger recipe provided here does produce an extremely moist and flavorful patty, you can certainly use leftover cooked burgers if you already have them on hand. Same idea applies to the nacho toppings; we went with a blend of typical Tex-mex toppers and backyard cookout accouterments, but you can vary things up however suits you. Your baking sheet will only be on the grill for a few minutes (just long enough for the cheese to melt) so you shouldn’t experience any issues with the pan warping or taking on grill marks. However, for easy clean-up, you can certainly go ahead and wrap your pan in aluminum foil. For an easy, autumnal dinner, this whole roasted chicken is the way to go. Perched on a bed of root veggies, fennel, apples, and mushrooms, this chicken becomes irresistibly crispy on the outside and succulent on the inside. Apples and mushrooms absorb the savory chicken fat and slowly break down throughout the slow-roasting process, making them almost melt-in-your-mouth delicious. The sheet pan will be crowded upon assembly, but don't fret, roasting will shrink the veggie and apple mixture's size. Marinating the steak the night before makes this one-pan dinner faster and more flavorful. Photography: Caitlin Bensel; Food Styling: Anna Hampton; Prop Styling: Thom Driver. Arrange the fish and the broccoli-carrot mixture on the same pan for quick cleanup. Add lemon wedges and bring to the table for a gorgeous presentation. An incredible steak dinner made on a single pan, in under 30 minutes? No, we’re not kidding. This mouthwateringly impressive meal couldn’t be easier to pull off, but is most definitely appropriate for a special occasion. But then, what isn’t when it’s topped with blue cheese butter? If you’re not a huge blue fan, you could easily use feta cheese instead. And to find even more inspired sheet pan meals, you’ll definitely want to pick up a copy of One Sheet Eats: 100+ Delicious Recipes All Made on a Baking Sheet. It’s definitely not traditional, but it sure is convenient (not to mention, way tasty). With our trusty sheet pan and a few smart supermarket shortcuts, we keep the prep for this weeknight jambalaya recipe incredibly quick and easy.